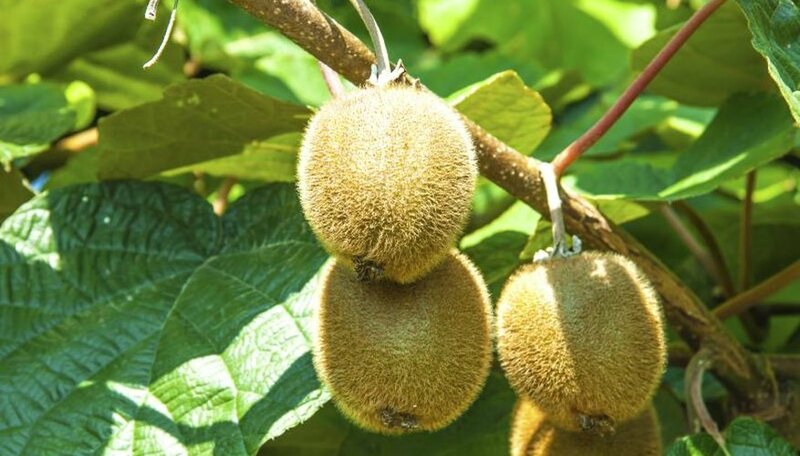 The two main kiwi varieties grown for fruit, hardy kiwi (Actinidia kolomikta) and kiwifruit (Actinidia deliciosa), require both male and female plants to produce fruit successfully. Hardy kiwi grows in U.S. Department of Agriculture plant hardiness zones 4 through 8, while kiwifruit grows in USDA zones 8 and 9. Proper pruning of newly planted kiwi vines, along with ongoing annual pruning for both male and female plants, helps increase fruit production while improving the health and shape of the plant. Bypass shears handle most kiwi pruning needs. Keep the blades properly sharpened so they easily slice through the vine without crushing it. If you must cut out large, woody vines or remove dead trunks, a pruning saw provides a better choice. Disinfect the pruning tools before use by wiping them with a cloth soaked in isopropyl alcohol. Wiping the tools down with the alcohol after cutting out diseased or pest-infested wood, or when moving between plants, helps minimize the spread of harmful pathogens among the plantings. Training young plants beginning in the first year of planting encourages even vine placement and better fruiting upon maturity. Both hardy kiwi and kiwifruit fruit on one-year-old vines. Train a single trunk up to the trellis lines, trimming off any lateral shoots branching from the main trunk when the plants are dormant in winter. If late spring frosts are common in your area, you can allow two or three upright trunks to develop from the base of the kiwi vine, trimming off the lateral branches that form on these trunks by cutting them flush to the trunk. When the trunks grow tall enough to reach the trellis, allow the lateral branches to grow in and stretch them over the trellis wires. Tie them in place loosely with cloth ties, if necessary, to keep them in place. It may take two to three years for the kiwi to fully mature and fill the trellis. After maturity, female kiwi still requires annual dormant pruning in mid- to late winter to maintain both shape and productivity. The main trunks, or leaders, don't usually require pruning. Instead, cut out any side shoots that develop beneath the trellis wires or stems, called suckers, that form around the base of the trunks. Cut side shoots off flush to the trunk and trim off suckers at ground level. Trim off the branches that have already fruited within the main canopy, leaving only the one-year wood on the plant. The one-year wood grows near the base of the old lateral fruiting branches. Cut back fruiting one-year wood with healthy buds back to only eight buds, making the cut within 1/4-inch of the eighth bud. Remove any crowded fruiting wood so the remaining lateral fruiting branches are spaced 8 to 15 inches apart. Peeling bark on the main trunk indicates late frost damage. You can saw off damaged main trunks at their base on multi-trunked vines without harming the kiwi. Frost damage on single-trunk kiwis usually results in death of the plant. Male kiwi plants produce more new growth each season than female plants. Male plants are only pruned in summer after flowering. Cut back the lateral flowering branches to an 8- to 10-inch length, where the new growth is most vigorous. Remove any lateral branches beneath the main canopy, suckers, or shoots reaching above the canopy at this time. Female plants require lighter summer pruning. Trim back the flowering shoots before fruiting to the sixth leaf past the last flower on each shoot. You can also remove any shoots without flowers that grow beyond the main trellis canopy, cutting them back to the main branch. Cut back the tips of any new shoots by 6 inches on the female plants in late summer to prevent tangling.